Escudilla Forest Inholding - Apache County, Arizona, Headquarters West Ltd. The property is located in eastern Arizona near the New Mexico state line in southern Apache County, approximately 200 miles northeast of Phoenix, Arizona and 170 miles southwest of Albuquerque, New Mexico. The property is situated on the eastern slope of Escudilla Mountain, 1 mile west of the New Mexico state line, 21 miles southeast of Springerville and 10 miles north of Alpine, Arizona. 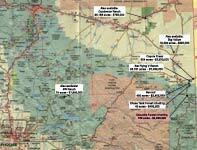 Access is provided by 8 miles of US Hwy 180 south from Springerville to Forest Road #275, then southeast 12 miles to Forest Road #577A, then 1 mile southeast to the property. Access from Alpine is provided by 10 miles north on Forest Road #275, then 1 mile southeast on Forest Road #577A to the property. Forest Road #275 is a well maintained, graded, gravel road from US Hwy 180. The property is completely surrounded by the National Forest on all sides and is mostly tree covered with secluded mountain meadow openings at the lower end. Building improvements are located at the edge of the meadow overlooking the spring-fed meadows and stock pond. There is a 3 room rustic log cabin (photos 1, 2, and 3 above) and a 2-room cowboy house on the property which could be restored for historic value. There are numerous large Ponderosa Pines on the property over 30 inches in trunk diameter. Mountain springs are used for livestock water. One spring has been developed for domestic water use (photo 3) and typically runs between 3 and 6 gallons per minute. Montane Conifer Forest with Ponderosa Pine, Blue Spruce and Oak trees. Primary grasses include Kentucky bluegrass, pine drop seed and mountain muhly. Average annual precipitation ranges from 18 to 20 inches with the majority coming in the late summer months during the monsoon season and during mid-winter in the form of heavy snow. Winter access is often restricted by accumulations of snow over a foot in depth. No public utilities are currently in use on the property.